As always as most of you know each Fall we introduce a new game to the Cashunt family. This year is no different and we are excited about this game! It will be introduced at Cashunt Championship VIII, this fall but we also did a test audience this past weekend and the response was great! What is "The Secret Dash" you may ask? well.........it's just that a "secret". No one will know what is coming next when they play this game, and us competition junkies here at the office love that! The best part is the this game will constantly be changing so there no dupes here, something we heavily believe in especially with this game. After the Championship, this game will be available as a live game starting in 2009. Team South Gets Knocked Out Of 1st Place! Just when you think you have the top spot for the season, you can get knocked off the following week just as quickly. Team South had the top spot for two weeks for the season untll The Mammas came in a blew them right out of the water. The Mammas claim the top seed for this Falls Cashunt Championship VIII, the question is will they keep that spot? I just love the competition so far with all the teams that are playing year, it is a really fun and funny thing to witness. 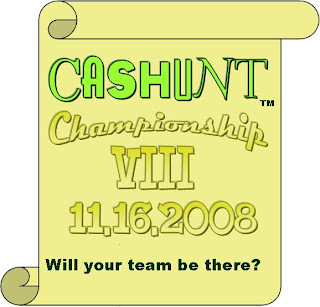 CASHUNT CHAMPIONSHIP VIII DATE IS ANNOUNCED! So far so great with this seasons Cashunt teams! I would probably say the best teams I have seen so far. With that being said a date has been annouced for November 16th in Boston. As always it will be a different game , different challenges, different championship. The season is still early so if you have played your game see where you stand in this 2008 season. Remember 4 teams will be invited one will be champion. Good Luck This Year, Cashunters! 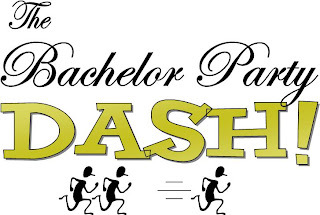 The Cashunt people have created a new game for the groom which is called The Bachelor Party DASH! Due to the calls that we recieved the past few months "if we do bachelor party scavenger hunts" we saw that there was a demand and went to our workbench to start putting together a customized , competitve game that will take the elements of a traditional CASHUNT with new additions of challenges for the groom and his guys. The game is being played only in Boston and started in April to great reviews. For more information on the game please call our offices at 866-276-4733. NEW CASHUNT LEADERS FOR THE CHAMPIONSHIP! As of today we have new a first place team for the Championship this October at Cashunt Championship VIII. As some of you might know we take the 4 best teams of the year and pit them against each other for prizes, etc.